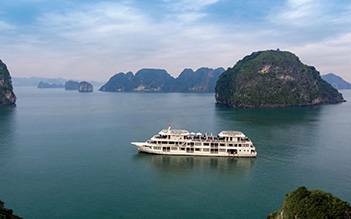 The northern area of Vietnam is always an attractive destination for tourists visiting the country. 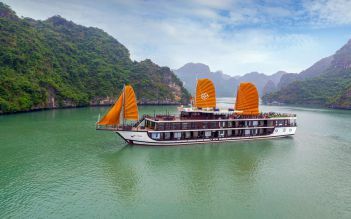 You will visit Halong Bay, a UNESCO World Natural Heritage site and New Seven Natural Wonder of the World. After exploring the area, you will return to Hanoi and take a night train to Lao Cai – a China-Vietnamese border city to join 2-day trekking tour in Sapa. 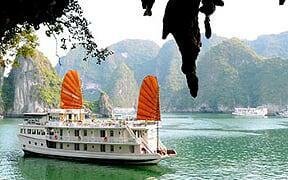 The package with luxurious services will bring you the most memorable vacation in Vietnam. 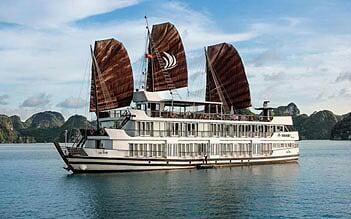 At noon: Arrive at Halong bay, tendering to the cruise, welcome on board and check in your cabin. Enjoy delicious lunch at the restaurant. 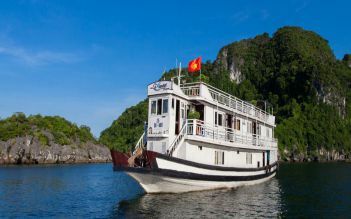 Afternoon activities might include a visit to one of the most beautiful cave in Halong bay, a floating village for bamboo boat riding, an island for relaxing/swimming and a lagoon for kayaking. Back to the boat, you will be able to join a cooking class or a sunset cocktail party before dinner time. Evening is free at your leisure or you can join a squid fishing trip with the crew. Overnight in private cabin on a sharing cruise. After breakfast, start trekking to Muong Hoa valley to visit 3 villages of the H’mong and the Day (Y Linh Ho, Lao Chai, Ta Van). Lunch on the way then head back to Sapa and free time until transfer to Lao Cai for the night train to Hanoi. Overnight on train.After breakfast, start trekking to Muong Hoa valley to visit 3 villages of the H’mong and the Day (Y Linh Ho, Lao Chai, Ta Van). Lunch on the way then head back to Sapa and free time until transfer to Lao Cai for the night train to Hanoi. Overnight on train. Early arrival in Hanoi (05.00 - 05.30 am), take taxi to the chosen hotel to store the luggage, have breakfast (no room) before start walking tour (09:00 am) to explore Hanoi Old Quarters. Then come back to hotel and free time until be picked up to transfer to the airport for forward flight (45 mins transfer). End of service. This was an incredible overnight tour, such an amazing experience. Sapa was so beautifully breathtaking, it was surreal. The treks were so much fun, and the mud some of these people described made it even more fun. For the other reviews that gave this tour less stars because you are trekking in muddy terrain and rice fields is not the tours fault... you have to know what you are getting yourself involved in. It really was not as difficult as some described, it was very enjoyable and slow paced to enjoy every little bit of scenery. Every direction you looked was just... wow. The hotel we stayed in was very nice, with an amazing view. Everything seemed to be organized, and our tour guide was very sweet and knowledgeable. The only thing that I disliked was the fact that the sleeper bus, on the way to Sapa from Hanoi, was not the same company of our actual tour which I did not know. 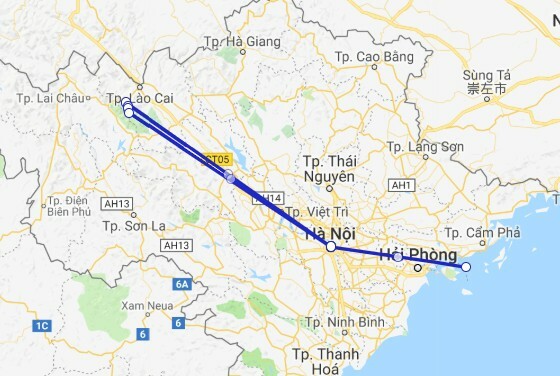 I got on the sleeper bus from Hanoi thinking everyone on the bus was part of our tour, which is not the case turns out no one that bus was on our tour which I thought was strange. It made me nervous thinking I wasn't on the right bus, but when we got off at Sapa at our stop, there was my tour guide with my name on a sign. Overall I highly recommend, it was such a great experience! Sapa is a must visit for people going to Hanoi. The bus trip is certainly different a lay down bus but the hotel where we stayed was very comfortable and the meals there were excellent. Our guide on the walks went out of his way to explain everything and to answer all questions. The only disappointing aspect is the amount of rubbish in the rivers and everywhere on the ground. The authorities will need to do something to clean this up before it becomes a health hazard ....... both for the environment and for the people of the area.